This past weekend was date night for Wendy and I. Actually, because of scheduling conflicts with the girls, it ended up being more of a matinee date as we finally got to see The Comedy of Errors Sunday afternoon at the Palace. It was time for a play in the Lockport Palace 2017-2018 season. I always look forward to it. While I love musicals, sometimes pays can be a refreshing change of pace. While I am not a huge fan of William Shakespeare’s works, The Comedy of Errors is one of his that I actually like. It is a fast-paced piece of literary comedy. The back and forth and cases of mistaken identity make for some laughs for anyone who made it to the show. The gentleman sitting next to Wendy was full of laughs throughout the show. The Comedy of Errors is the story of two sets of identical twins who were separated as babies during a shipwreck. Even the parents were separated. The story takes place in Ephesus where Antipholus of Syracuse and his servant, Dromio of Syracuse have just arrived. Unbeknownst to them their twins, ironically with the same names, live in Ephesus. Of course, they are all mistaken for one another, and it’s a hilarious trip as everyone tries to figure out who exactly belongs with whom, and where. Jason Mussachio and Chris Miller each played an Antipholus, from Syracuse and Ephesus respectively. In addition to definitely resembling each other, they brought their own brands of comedy to the roles. From my vantage point, it appeared that they shared some minor traits to reinforce to the audience that they were the long lost brothers. These two had great comedic timing. It was fun to watch either of them interact with the other characters, especially when undergoing a case of mistaken identity. Emily Stoll and Hilda Myer-Post were just as funny in the roles of Dromio. Their roles were slapstick all the way. With each pratfall, the audience filled the theater with laughter. The facial expressions of Myer-Post throughout the production only added to the hilarity. Their rushing around the stage in a frenzy was fun to watch. Despite being dedicated to their respective Antipholus, their scenes with the opposite men made for great misdirection. Allyson Quader played, Adriana, the hapless wife of Antipholus of Ephesus. When Antipholus of Syracuse runs into her and doesn’t recognize her, she takes it as a confirmation that her husband has his eye on another woman. She beguiles the wrong brother into her bed as a means to keep her husband’s eyes on her and her alone. Quader’s seduction of Mussachio was uproariously funny. 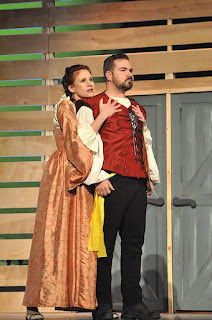 Meanwhile, Mussachio’s Antipholus finds himself attracted to Adriana’s sister, played by Jessica Leigh Tokarski. Her obvious discomfort when Antipholus flirts with her looked real and was eerily familiar to my teenage years. The expressions across all the faces of the actors and actresses on stage are oftentimes just as effective as the dialogue and body language. Tokarski’s expressions made me laugh. The beauty of having a small cast like in The Comedy of Errors means that the actors and actresses can really get to know each other and form close relationships that make the performance on stage much more endearing and realistic. The group of support actors added to this relationship on stage with their own, superior talents. 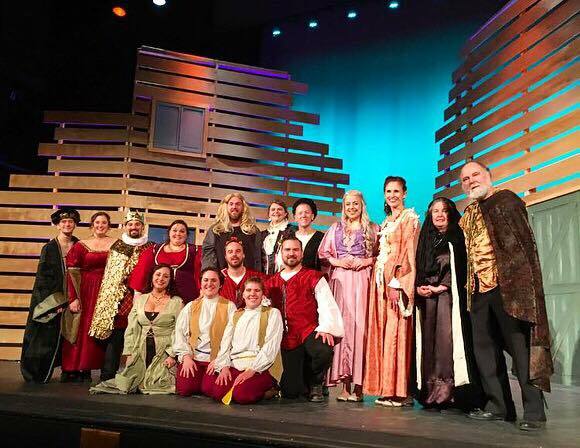 Shows like The Comedy of Errors at the Historic Palace Theatre in Lockport showcases exactly how talented the local actors and actresses are. Shakespeare is not an easy production. It’s lyrical language can be difficult. With directors Gabrielle Montgomery and Geoff Koplas at the helm, the Palace was once again able to pull off an excellent show. Montgomery and Koplas are regularly on stage, they’ve taken that experience and applied it to this production. That experience shines through. Craig Bacon is a fan of the plays at the Palace. He’s written one play already, and is working on another. Maybe someday they will be seen on the stage at the Palace.